For this episode of Soundwaves, lead guitarist and vocalist Skunk comes in to talk about his band Scary Uncle Steve. Accompanying him in the band is Jesse Struggle on the bass, Dave Motiee on drums and Nate Wilson on the accordion. The recent move of Nate to Canada has shifted the band dynamics, but the band is continuing to figure out ways to write and rehearse digitally. With a missing frontman, Scary Uncle Steve’s sound didn’t feel as full, so they reached out to Wicked Bears’ Nick Fleming and, without any previous experience with the instrument, he began as their keyboardist. Previously in the band Desolate, Skunk, Nate and Dave played thrashy punk, a sound that often drove away the unfamiliar listener. In an attempt to create something more digestible, Skunk and Nate started writing acoustically, taking inspiration from bands such as Mischief Brew and The Taxpayers. Eventually, Motiee joined the new project as the drummer, and after lots of convincing and even more beer, they talked Jesse into being their bass player. Taking inspiration from the “Uncle Steve” that everyone has, the band’s name started as a joke during an old Localized interview for the band they were in at the time, Dubbed. 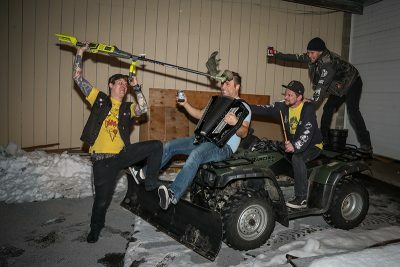 The band is often categorized falsely as folk punk—though their sound is similar, the strong political stance often associated with folk punk is less present in their writing. Rather than rising up for the working class, as Skunk puts it, they work to rise up from their beds and drink a beer. Scary Uncle Steve also isn’t tied to playing only original music, and they’re certainly not tied to only playing punk. Turning to older songs like “Come on Eileen,” they substitute the accordion for previously guitar-driven melodies, and create something nostalgic yet unfamiliar. The band was able to record an album before Nate moved to British Columbia, however, given their current limbo state, there are no upcoming shows or albums to look for. You can listen to their music at scaryunclestevetunes.bandcamp.com and keep up with them on Facebook.